Authors: Zakharjan E.A., Pozdeev A.P., Vilensky V.A. Background. Correction of deformities and lengthening of the lower extremities in patients with healed congenital pseudarthrosis of tibia (cCPT) is associated with certain characteristics, difficulties, and complications. But even the restoration of the anatomy and length of the tibia does not solve the problem of further recurrence of the deformity. Aim. This study aimed to evaluate the results of the correction of deformities of the tibia in patients with congenital pseudarthrosis of the tibia after achieving union by using external fixation and guided growth. Materials and methods. The results of treatment of 19 patients with cCPT, aged 4–15 years, which were observed in the Department of the Turner Scientific Research Institute from 2013 to 2018 years, were analyzed. We analyzed the types of deformities before the stage of correction deformities, evaluated the accuracy of the correction deformities after two-level osteotomies of the tibia, and used ortho-SUv passive computer navigation. External fixation index and number of complications were also determined. The type and number of recurrence of deformities and the timing of their detection were analyzed. Results. On the basis of clinical classification, patients with cCPT had complex deformities of the affected lower limb. The accuracy of the correction of deformities was 84% at the end of the correction period. The amount of elongation was 4.5 ± 1.5 cm. The IEF was 64.3 ± 40.6 days/cm. After the end of the external fixation period, deformities recurred in 100% of cases. In 17 patients, temporary hemiepiphysiodesis of the tibial bones, the second stage, was performed. The accuracy of the correction was 100%. The period of correction ranged from 12 to 14 months. Discussion. In the literature, we found no studies investigating the accuracy of the deformity correction, the choice of the level of osteotomies in patients with cCPT. Considering these data and the experience of the senior author of the publication, we performed two osteotomies of the tibia, outside the consolidation zone of the pseudarthrosis. High accuracy of the correction deformities was achieved in conjunction with the use of the ortho-SUv frame. Conclusion. The analysis showed that the deformity relapsed in 100% of children as the child grows, regardless of the accuracy of the deformity correction in children after achieving union CPT. Hemiepiphysiodesis is an effective treatment for this complication. deformity correction, external fixation, guided growth, hemiepiphysiodesis, congenital pseudarthrosis of tibia. Treatment for patients with congenital pseudoarthrosis of the shin bone remains an urgent problem for contemporary orthopedics because achievement of consolidation in the field of pseudoarthrosis is challenging [1–6]. Restoration of the integrity of the tibia is the desired result, and once it is achieved, new treatments can be initiated 7]. Surgical interventions, such as deformity correction and lower extremity lengthening, are performed to eliminate the limb-length discrepancy and to prevent recurrent pathological fractures. They are special stages in the treatment for patients with consolidated congenital pseudoarthrosis of the shin bone (cCPASB), and are associated with certain aspects, difficulties, and complications. Ilizarov method serves as the standard treatment method for patients with shortened and deformed long bones of lower extremities [8, 9]. It is known that the use of modern transosseous apparatuses and units based on computer navigation results in highly accurate deformity correction, reportedly ranging from 80% to 96% [1–6]. Bone deformities in the lower legs of pediatric patients with cCPASB are not an exception . However, in the global literature, data on the use of transosseous osteosynthesis for lengthening and deformity correction of the tibia in the case of cCPASB is scarce [8–10]. The primary challenge in treating children with cCPASB is that osteotomy at the apex of the deformity is impossible, as this area is generally affected by pathological processes and osteotomy with lengthening bears the risk of recurrence into pseudoarthrosis . Single-level osteotomy of the shin bones outside the apex of the deformity (in the region of relatively healthy bone) combined with transosseous osteosynthesis eliminates the limb-length discrepancy, but may not solve the problem of deformity correction. In such situations, a two-level osteotomy is indicated . Still, restoration of the integrity and lengthening of the tibia does not prevent subsequent recurrence of the deformity. The existing method of controlled growth i.e., hemiepiphysiodesis enables an effective correction of long-bone deformities with varying pathologies in growing children [11–16]. Taking into consideration the tendency of deformities to recur in patients with cCPASB, we suggested that the consistent use of hemiepiphysiodesis following lengthening and deformity correction will improve the quality of treatment for pediatric patients. This study aims to evaluate the results of treatment for pediatric patients with deformities and shortening of the shin bones in the case of cCPASB. All pediatric patients were treated using transosseous osteosynthesis and hemiepiphysiodesis. We analyzed the results of treatment for 19 patients with cCPASB, who were observed and treated in the bone pathology department of the Turner Scientific Research Institute for Children’s Orthopedics from 2013 to 2018. Only children with functioning growth zones of the lower extremities (aged 4–15 years) were enrolled in this study. The mean age of patients was 8.3 ± 3.1 years. During the planning of deformity correction, all patients underwent panoramic radiograph of the lower extremities in 2 standard views and computed tomography of the lower extremities. Preliminary planning of deformity correction was conducted using specialized software (TraumaCad, Boneninja) . The standard algorithm was used in the planning [17, 18], namely, the anatomical and mechanical axes of the proximal and distal fragments of tibia in 2 views and the apex of the deformity were determined. In all cases, the apex of the deformity was in the area of consolidated pseudoarthrosis. In this regard, given the risks of recurrence of the pseudoarthrosis, we were obligated to perform a two-level osteotomy (in regions of relatively healthy bone), thereby reducing the displacement of bone fragments in width, which occurs when osteotomy is performed at a distance from the apex of the deformity. In all cases, transosseous osteosynthesis was performed with subsequent lengthening and deformity correction. A unit with Ortho-SUV computer navigation properties was used as a repositional one [19–21]. In the first part of our study, we analyzed the deformity types in patients with cCPASB prior to surgery, to assess the accuracy of deformity correction, the external fixation index (EFI), and the number of complications in pediatric patients. Taking into consideration our previous findings, we assumed that in most patients, regardless of the accuracy of deformity correction, it will recur after removing the compression distraction apparatus. Thus, we analyzed the number of deformity recurrences, the timing of recurrences, and the type of secondary deformity. The accuracy of deformity correction was assessed by radiological examinations and determination of the reference values of the tibial angles, namely mechanical medial proximal tibial angle (mMPTA); mechanical lateral distal tibial angle (mLDTA), anatomical posterior proximal tibial angle (aPPTA), and anatomical anterior distal tibial angle (aADTA) [22, 23]. Deformity correction was considered accurate (normal) when the reference values of the tibial angles were within the accepted ranges. We defined this indicator following deformity correction and external fixation. In the second part of the study, we analyzed the results of hemiepiphysiodesis in treating recurrent deformities in pediatric patients following lengthening and deformity correction. Parameters such as accuracy, timing of hemiepiphysiodesis, and the nature of complications were studied. According to the classification of long-bone deformities, patients with cCPASB had developed complex lower extremity deformities, as evidenced by the radiographs and computed tomography . A combination of deformities in the frontal and sagittal planes, a torsional component, and shortening of the affected segment were clearly evident. In addition, valgus-recurvation deformity of the proximal section and valgus-antecurvational-torsion deformities of the distal shin bones were typical. Patients had both external and internal torsion of the shin bones. The reference angle values of the tibia prior to deformity correction are presented in Table 1. Note. mMPTA — mechanical medial proximal tibial angle; mLDTA — mechanical lateral distal tibial angle; aPPTA — anatomical posterior proximal tibial angle; aADTA — anatomical anterior distal tibial angle. The average accuracy of deformity correction was 84% in the total number of patients (95% with correction of deformities in the frontal plane, and 80% with correction of deformities in the sagittal plane), and the degree of lower extremity lengthening was 4.5 ± 1.5 cm. The complexity of deformity correction was due to a large number of surgical hardware obstructing the review of the articular surfaces of the bone and due to the penetration of the bone tissue of distal tibia with wires and rods when moving them in space. EFI in pediatric patients with cCPASB amounted to 64.3 ± 40.6 days/cm. The obtained data were similar to the results of small studies in patients with cCPASB. Category 3 complications (complications which required additional surgical interventions and affected the outcome of the treatment) included fractures of the regenerated bone or tibial diaphysis in the late follow-up period. Thus, fractures of the tibial diaphysis with the subsequent recurrence of pseudoarthrosis were detected in 3 patients. In 2 patients, fractures occurred in the first year after dismantling the external fixation device with fracture localization in the lower third of tibial bones. In one patient, fracture occurred 3 years after the previous treatment. All patients underwent repeated surgeries to restore the integrity of the shin bones. At the end of the external fixation period, we repeatedly determined the accuracy of deformity correction. Recurrent deformities were detected in all cases. Recurrence of the valgus component of the deformity was established in 12 patients in the proximal part and in 6 patients in the distal part of the tibia. Five patients had a varus deformity in the distal tibial bone. In 4 cases, recurvation deformity was detected when evaluating the sagittal plane. In 16 cases, antecurvation deformity of the tibial bones with a predominant apex of the deformity in the distal section was revealed. Thus, analysis of the accuracy of deformity correction, comparison of the reference angle values after the correction and fixation periods, and the subsequently revealed secondary deformities of shin bones indicate a dysfunction of tibial growth zones in patients with cCPASB, the cause for which was not established in this study. All patients underwent temporary hemiepiphysiodesis of the tibial bones for deformity correction. We used hemiepiphysiodesis for deformity correction in the frontal plane, both in the proximal and distal tibial bones, separately or jointly. These interventions were performed in 17 patients (8 boys and 9 girls). Temporary hemiepiphysiodesis of the medial segment of the proximal tibial growth zone was performed in 3 patients, in the distal tibial bone of 6 patients, whereas it was performed at 2 levels of the tibia in 8 patients. To assess the accuracy of deformity correction, control radiographs of the shin bones were performed 6 months following the surgery, and then every 3 months until deformity correction was achieved. Following lengthening and deformity correction with transosseous apparatus and hemiepiphysiodesis, the accuracy achieved in eliminating the recurrence of deformities in the frontal plane was 100%. The period of deformity correction was 12–14 months. The patients had no complications during these surgical interventions. Patient T., 9 years old, was admitted to the clinic at the Turner Scientific Research Institute for Children’s Orthopedics with a diagnosis of consolidated congenital pseudoarthrosis of the right tibial bones. The case history revealed that the bone deformity in the right tibia was detected in the child at birth. At the age of about 1, with the beginning of walking, pathological tibia fracture occurred with pseudoarthrosis. The child received multiple surgical treatments at the primary health care facility, but it was not possible to achieve consolidation of the ends of the bone fragments of tibial bones. 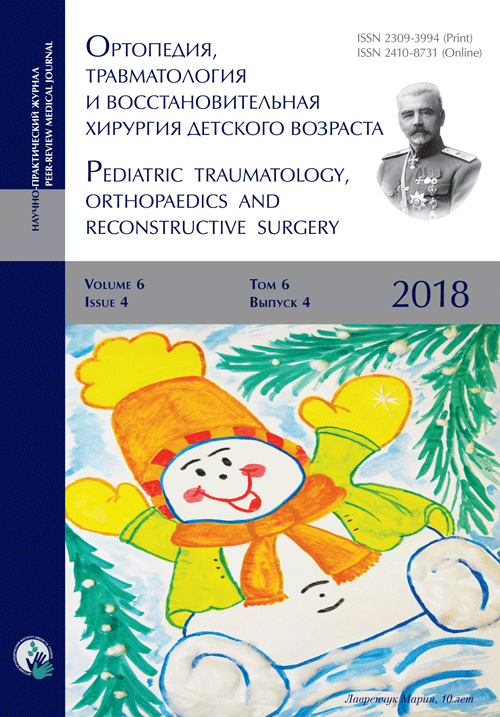 We performed open lateral compression osteosynthesis on the child at the age of 2.5 years, and consolidation of the bone fragments of tibial bones was achieved. In the postoperative period, walking in an orthosis was recommended. After following-up for 3 years, radiographs revealed the formation of Looser’s zone in the surgical area. As a result, it was decided to perform open lateral compression osteosynthesis to eliminate Looser’s zone due to the damage to the integrity tibial bone. Consolidation of bone fragments of the pseudoarthrosis region was achieved within 3 months. The second stage of treatment was the recommended correction of the resulting multiplane deformities of the affected lower extremity (mMPTA was 94°, mLDTA was 71°, aPPTA was 90°, and aADTA was 59°, shortening the affected lower limb by 8.0 cm). For lengthening and deformity correction of the right lower limb, the patient underwent preoperative planning for deformity correction with the exception of osteotomies in the area of consolidated pseudoarthrosis at the age of 9 years. According to the plan, a two-level osteotomy of the shin bones was performed, as along with lengthening by 5 cm by the Ilizarov method. The deformity was corrected using a repositional unit with Ortho-SUV computer navigation properties. The period of deformity correction was 58 days, and the external fixation period was 247 days. At the end of the fixation period, a recurrence of deformities of the tibial bones was detected with the formation of a deformity apex at the level of the proximal and distal tibial growth zones (mMPTA was 94°, mLDTA was 82°, aPPTA was 86°, and aADTA was 80°) (Fig. 1–4). We applied hemiepiphysiodesis to correct the recurrence of valgus deformity of the tibia. The period of deformity correction was 269 days. The reference angles values of the tibia were within the accepted ranges. Treatment of congenital pseudoarthrosis of the shin bones remains as one of the serious problems in contemporary orthopedics of childhood . Techniques developed over the past 30 years enable consolidation of the pseudoarthrosis in a fairly high percentage of cases, from 75% to 85% [1–3, 6]. Thus, it can be argued that this problem is not of utmost urgency. However, the treatment of patients with congenital pseudoarthrosis of the shin bones does not end at the stage of consolidation of the pseudoarthrosis. It is known that there will be a lag in the growth of the tibia, and its complex multiplanar deformities may occur in the future. Deformity treatment and lower leg shortening in case of consolidated pseudoarthrosis is extremely problematic, as there are potential risks of refracture, in addition to recurrence of pseudoarthrosis and deformity. We have found only 3 publications devoted to this problem in literature. Inan et al. reported 16 analyzed cases of patients with shortenings and deformities of the lower leg along with consolidated pseudoarthrosis. In this study lengthening was performed only in 3 cases; in other cases, temporary epiphysiodesis of the bones of a healthy limb was performed to shorten it. It should be noted that in 2 of 3 cases, there were complications in the form of a pseudoarthrosis. Cho et al. provided the results of 27 cases of tibia lengthening in 22 patients with consolidated pseudoarthrosis, who underwent a single-level osteotomy in the proximal third and tibia lengthening. The magnitude of the elongation amounted to 3.7 cm (1.0–9.1 cm). The average EFI was 89 days/cm, which was two-fold higher than that in pediatric patients with the consequences of injury . G. Zhu et al. reported 11 cases of lower extremity lengthening in patients with consolidated pseudoarthrosis. In all cases, the osteotomy of the upper third of the shin bones and lengthening were also performed. The text of the article did not clarify whether only shortening was performed, or deformities were corrected as well. In addition, the deciding factor in the choice of osteotomy level was not clearly stated. Based on the radiographs presented, the surgeons did not state the objective for eliminating all the components of the deformity and sought only to lengthen the segment. The publication also draws attention to the extremely high EFI of 63.1 days/cm, slightly differing from the EFI obtained by us (64.3 ± 40.6 days/cm). Such high EFI indicates a slow maturation of the distraction regenerate, which can be completely explained by the pathological process underlying this disease. In the literature, we could not find a single publication devoted to the accuracy of deformity correction and the choice of osteotomy level(s). It was only mentioned that osteotomy in the area of the deformity apex, most often located at the level of consolidation of the pseudoarthrosis, can lead to lysis of the ends of bone fragments in the region of osteotomy and pseudoarthrosis . Considering these data and our own experience of several years, we performed 2 osteotomies of the shin bones, located as high and low as possible, outside the zone of consolidation of the pseudoarthrosis and the pathologically-changed bone, determined radiologically. In conjunction with the use of the Ortho-SUV transosseous unit with computer navigation properties, highly accurate deformity correction was achieved, which was 95% for deformities in the frontal plane and 80% for deformities in the sagittal plane. Our hypothesis, that regardless of the accuracy of deformity correction for eliminating the difference in the lengths of the lower extremities, the deformities will recur as the child grows, was confirmed in 100% of cases. Unfortunately, no data on correction of these deformities is available. Therefore, the question about the timing of recurrence of deformities is of interest. In the pediatric patients analyzed by us, the recurrence of deformities in all cases was noted at the time of disassembly of the transosseous apparatus. Meanwhile, in all cases, the segment length achieved as a result of transosseous osteosynthesis was maintained. We would also like to talk more specifically about the aspects of the method of hemiepiphysiodesis. Despite the extremely high popularity of this method in the treatment of lower limb deformities in a growing child against various diseases [11–15], we did not find any systemic review of hemiepiphysiodesis in patients with deformities in cases of consolidated congenital pseudoarthrosis of the lower leg. In a publication by P. Stevens , the author described the method and provided radiographs of a child with consolidated pseudoarthrosis and described how hemiepiphysiodesis was used for correction of secondary deformities. However, the low injury rate of hemiepiphysiodesis, the presence of functioning growth zones, the absence of difference in the lengths of the lower extremities after the first stage served as a prerequisite for the second part of our study. Our results confirm that hemiepiphysiodesis is highly efficient in treating the recurrence of deformities. The analysis shows that in 100% of cases, there is a recurrence of deformity as a child grows, regardless of the accuracy of deformity correction in cases of consolidated pseudoarthrosis of the shin bone. Hence, hemiepiphysiodesis could be an effective treatment for this complication. Source of funding. The study was supported by the Turner Scientific Research Institute for Children’s Orthopedics within the framework of the research. Conflict of interest. Author V.A. Vilensky declares that he is an employee of the company Ortho-SUV. The remaining authors declare no obvious and potential conflicts of interest related to the publication of this article. Ethical review. Patients and their representatives consented to the processing and publication of personal data. E.A. Zakharyan developed the research methodology, drafted all sections of the article, collected and processed the literature, and performed surgery on 19 patients. A.P. Pozdeev managed and participated in the development of the study methodology. V.A. Vilensky participated in data processing, participated in discussions regarding the drafting of the manuscript, and updated the Materials and Methods section. Shah H, Doddabasappa SN, Joseph B. Congenital pseudarthrosis of the tibia treated with intramedullary rodding and cortical bone grafting: a follow-up study at skeletal maturity. J Pediatr Orthop. 2011;31(1):79-88. doi: 10.1097/BPO.0b013e318202c45d. doi: 10.1097/BPO.0b013e318202c45. Pannier S, Pejin Z, Dana C, et al. Induced membrane technique for the treatment of congenital pseudarthrosis of the tibia: preliminary results of five cases. J Child Orthop. 2013;7(6):477-485. doi: 10.1007/s11832-013-0535-2. Thabet AM, Paley D, Kocaoglu M, et al. Periosteal grafting for congenital pseudarthrosis of the tibia: a preliminary report. Clin Orthop Relat Res. 2008;466(12):2981-2994. doi: 10.1007/s11999-008-0556-1. Borzunov DY, Chevardin AY, Mitrofanov AI. Management of congenital pseudarthrosis of the tibia with the Ilizarov method in a paediatric population: influence of aetiological factors. Int Orthop. 2016;40(2):331-339. doi: 10.1007/s00264-015-3029-7. Cho TJ, Choi IH, Lee KS, et al. Proximal tibial lengthening by distraction osteogenesis in congenital pseudarthrosis of the tibia. J Pediatr Orthop. 2007;27(8):915-920. doi: 10.1097/bpo.0b013e31815a6058. Zhu GH, Mei HB, He RG, et al. Effect of distraction osteogenesis in patient with tibial shortening after initial union of Congenital Pseudarthrosis of the Tibia (CPT): a preliminary study. BMC Musculoskelet Disord. 2015;16:216. doi: 10.1186/s12891-015-0680-5. Choi IH, Cho TJ, Moon HJ. Ilizarov treatment of congenital pseudarthrosis of the tibia: a multi-targeted approach using the Ilizarov technique. Clin Orthop Surg. 2011;3(1):1-8. doi: 10.4055/cios.2011.3.1.1. Stevens PM. The role of guided growth as it relates to limb lengthening. J Child Orthop. 2016;10(6):479-486. doi: 10.1007/s11832-016-0779-8. Stevens PM. Guided growth for angular correction: a preliminary series using a tension band plate. J Pediatr Orthop. 2007;27(3):253-259. doi: 10.1097/BPO.0b013e31803433a1. van Oosterbos M, van der Zwan AL, van der Woude HJ, Ham SJ. Correction of ankle valgus by hemiepiphysiodesis using the tension band principle in patients with multiple hereditary exostosis. J Child Orthop. 2016;10(3):267-273. doi: 10.1007/s11832-016-0742-8. Burghardt RD, Herzenberg JE. Temporary hemiepiphysiodesis with the eight-plate for angular deformities: mid-term results. J Orthop Sci. 2010;15(5):699-704. doi: 10.1007/s00776-010-1514-9. Danino B, Rodl R, Herzenberg JE, et al. Guided growth: preliminary results of a multinational study of 967 physes in 537 patients. J Child Orthop. 2018;12(1):91-96. doi: 10.1302/1863-2548.12.170050. Виленский В.А., Захарьян Е.А., Поздеев А.А., и др. Лечение детей с врожденными деформациями длинных костей нижних конечностей путем последовательного использования управляемого роста и чрескостного остеосинтеза (предварительное сообщение) // Ортопедия, травматология и восстановительная хирургия детского возраста. – 2018. – Т. 6. – № 3. – С. 12–24. [Vilensky VA, Zakharyan EA, Pozdeev AA, et al. Treatment of congenital long-bone deformities in children using the consequtive application of guided growth and external fixation: preliminary report. Pediatric traumatology, orthopaedics and reconstructive surgery. 2018;6(3):12-24. (In Russ.)]. doi: 10.17816/PTORS6312-24. Paley D. Principles of deformity correction. Exercise Workbook. New York: Springer-Verlag; 2002. Normal lower limb alignment and joint orientation. Ed by D. Paley. Principles of Deformity Correction. Berlin, Germany: Springer-Verlag; 2005. P. 1-18. Виленский В.А., Поздеев А.А., Зубаиров Т.Ф., и др. Лечение детей с деформациями длинных трубчатых костей нижних конечностей методом чрескостного остеосинтеза с использованием аппарата Орто-СУВ: анализ 213 случаев // Ортопедия, травматология и восстановительная хирургия детского возраста. – 2016. – Т. 4. – № 4. – С. 21–32. [Vilensky VA, Pozdeev AA, Zubairov TF, et al. Treatment of pediatric patients with lower extremity deformities using software-assisted Ortho-SUV Frame: analysis of 213 cases. Pediatric traumatology, orthopaedics and reconstructive surgery. 2016;4(4):21-32. (In Russ.)]. doi: 10.17816/PTORS4421-32. Vargas Barreto B, Caton J, Merabet Z, et al. Complications of Ilizarov leg lengthening: a comparative study between patients with leg length discrepancy and short stature. Int Orthop. 2007;31(5):587-591. doi: 10.1007/s00264-006-0236-2. Inan M, El Rassi G, Riddle EC, Kumar SJ. Residual deformities following successful initial bone union in congenital pseudoarthrosis of the tibia. J Pediatr Orthop. 2006;26(3):393-399. doi: 10.1097/01.bpo.0000217716.64986.f0.